Reborn dolls... cute or creepy? - ProudMummy.com the Web's Community for Mums. Home » Blog » Reborn dolls... cute or creepy? Reborn dolls... cute or creepy? Reborn dolls are in buggies, car seats and definitely in loads of stores. But who is buying them--and why? Reborn dolls came out in the late 1990's. Collectors liked their lifelike quality and a niche market developed. Warmth packs, a heartbeat, or an apparatus to simulate breathing are often added. Crafters of handmade items have gotten in on the craze as well. They purchase the doll parts and add their own artistic touches. The reborn doll stores are often called "nurseries" and the purchasers are called "adoptees" in keeping with the realism of this unique craft. 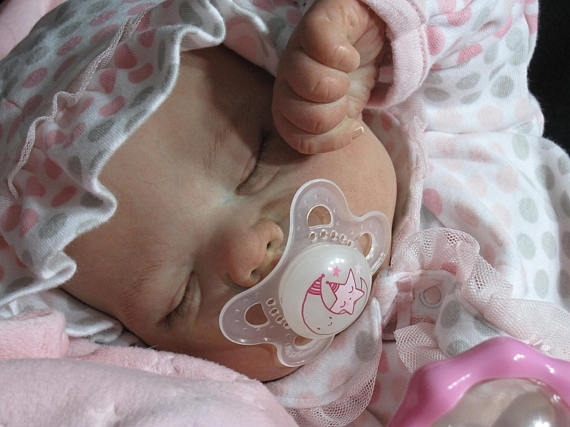 Most of the reborn doll customers are older women, not young children. Some of these customers are collectors. But some buyers actually treat these reborns as living "babies." It's said that these dolls fill an emotional vacancy, such as a miscarriage or an empty nest. Reborns also play a part in a unique type of therapy. When elderly memory care patients hold and care for the doll, they can become peaceful and calm. Many reborn doll owners simply see this as a hobby. They dress, bathe and walk their dolls. Some call this "cuddle therapy" because cuddling actually releases hormones. So when does the cute and cuddly become, well...creepy? Many reborn owners become quite attached to their dolls. That's tough for many of us to understand. Reborns seem eerily realistic. Some stores refuse to carry the dolls because they are just too lifelike. Because the dolls appear so real, they have been mistaken for real babies. There have been cases where people report seeing a baby left in a vehicle, and after attempting to rescue it, find that it’s only a doll. So...what do you think? Is this an adorable trend? a strange collecting craze? a pathology? or simply a harmless hobby?